What is the Interfaith Regional Gathering? 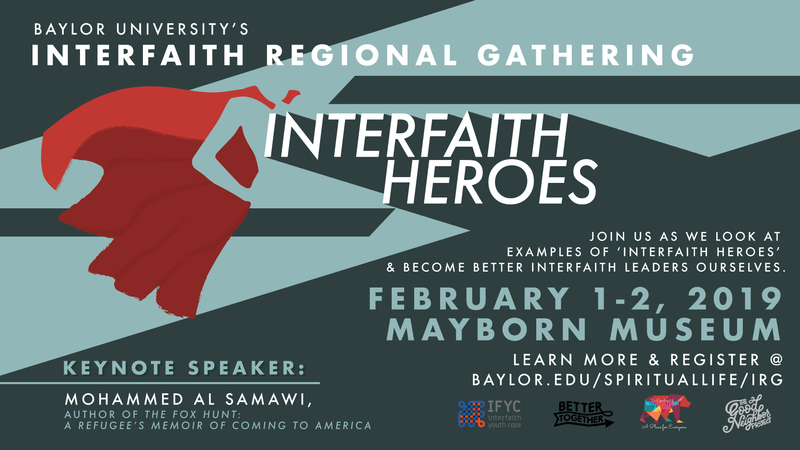 The Interfaith Regional Gathering is a Baylor Conference hosted by Spirituality and Public Life and Multicultural Affairs that will provide workshops on Interfaith heroes and ways in which we can become better interfaith leaders ourselves. The Conference will feature a keynote address with Mohammed Al Samawi, the author of The Fox Hunt. Who can attend the Interfaith Regional Gathering? All students, faculty, and staff from schools and institutions across the southwest are welcome to register for the event. Why would you encourage students to attend the Interfaith Regional Gathering? I would encourage students to attend the conference to learn more about different faith backgrounds and get to know others who are involved in interfaith work if they are interested in learning more about what it means to be an interfaith leader. What do you hope students take away from the Interfaith Regional Gathering? I hope students are able to grow in their religious/cultural humility and literacy through this conference. I would hope they learn something new about someone else’s story and feel compelled to share their stories as well. What are you most excited about the Interfaith Regional Gathering this year? I am most excited to hear from Mohammed Al Samawi. His story of his own interfaith experiences is fascinating, and I look forward to our students and attendees being able to hear from him. Mohammed Al Samawi, the author of The Fox Hunt. His story as a practicing Muslim born in Sana’a, Yemen and his experiences with interfaith activism are powerful in the midst of Yemen’s civil war. His bravery and escape from the civil way is a true testament to what is possible when one builds friendships across differences. Why are interfaith conversations important? Interfaith conversations are important because we need to be able to strengthen our ability to not only share our stories and our faith but also our ability to listen with respect and humility to others who are willing to share their stories and faith identities with us. Interfaith conversations allow us to better understand others and work well across differences. When we participate in interfaith dialogue, we find that we have more in common than we originally believed, and develop a mutual respect for one another. What if I’ve never participated in an interfaith event? You are still welcome! This conference does not require any expertise in interfaith work, simply a willingness to learn something new! Where and when is theInterfaith Regional Gathering? Mayborn Museum. February 1-2, 2019. Where can people register for the Interfaith Regional Gathering? https://www1.baylor.edu/ers/register.aspx?event_id=119837or go to baylor.edu/spirituallife/irgThanks so much to Jesse for answering all my questions! I’m super excited about the event, see you there?